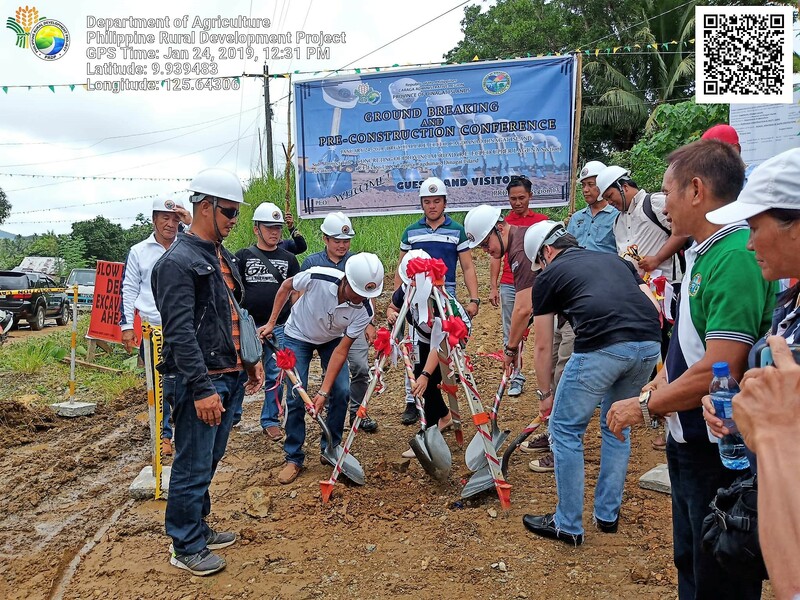 The Department of Agriculture-Philippine Rural Development Project (DA-PRDP) in Caraga Region in partnership with Local Government Units recently breaks ground with two infrastructure projects totaling P158 Million. These are the Construction of the P50 Million Communal Irrigation System (CIS) in Barangay Poblacion, Rosario Agusan del Sur and the Construction of the 3.62 km Farm-to-Market Road (FMR) in Barangay R.E. Ecleo, San Jose, Province of Dinagat Islands amounting to P108 Million. The Construction of 4.76 km Main Canal with Structures of the Limbatangan CIS in Rodario has a length of 4,961 meters with 23 units of canal structures to serve 264 hectares of rice area in Barangay Libuac, Poblacion and Tagbayan. Both ground-breaking activities were followed by a pre-construction conference participated the stakeholders of the project such as farmers, barangay officials, and the Barangay Implementing Team (BIT), municipal implementing units, PRDP regional counterparts and the contractor themselves. Purpose of which is to discuss the different aspects of the project and the role of each stakeholder that would ensure the smooth and proper implementation of the project.